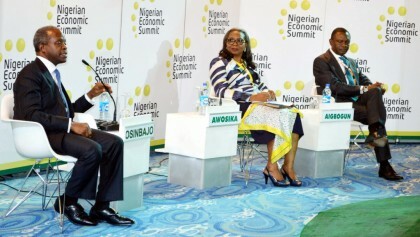 The Nigeria Economic Summit Group (NESG) has underscored the importance of the legislature in ensuring a conducive and business-friendly environment for the growth and development of any economy. The Chairman of the Board of the NESG, Mr. Kyari Bukar, who stated this during the formal presentation of the Business Environment Legislative Review Report to the Senate President, Dr. Abubakar Bukola Saraki in Abuja, said that without such proactive interventions, the nation risks losing the few jobs available as well as the opportunity of moving significantly upwards in the doing business ranking and the world economic forum competitiveness ranking. He commended the 8th National Assembly for its efforts and commitment at ensuring that there are appropriate regulatory and legislative instruments to make the business environment in Nigeria conducive for investments to thrive. Bukar said: “A friend of mine keeps saying that there is really no difference between running a business and running a country. If you don’t have proper governance processes and in the case of a nation, legislative and regulatory framework in place, you still do not have sustainable outcome. “This is why our legislature has a critical role to play for exercising its powers to make, amend or repeal the necessary laws that will facilitate the development of small and medium enterprises. “Permit me to note that without the legislature giving priority to the Business Environment, the nation risks losing what little jobs are currently available as well as risks losing the opportunity of moving significantly on the doing business rankings or indeed the world economic forum competitiveness rankings as it is common knowledge that our poor performance is largely as a result of constraints in the business environment. “I am however pleased to note with confidence that the 8th National Assembly has demonstrated its commitment to making the business environment right in Nigeria,” he said. While acknowledging the “visionary leadership of the 8th Assembly” and its dedication to public engagement with the citizenry and public sector targeted at making Nigeria a modern and globally competitive nation, Bukar said: “The report is an embodiment of the canvassed shift for government to be proactive and strategic with regards to creating a conducive environment for businesses to thrive sustainably. “The imperative for this being that over 37 million micro and medium enterprises exist in Nigeria and contributing approximately 50 per cent of GDP in nominal terms and account for 84 per cent of all jobs. “It is therefore imperative that the business environment is urgently addressed in order to mitigate negative impacts associated with current economic downturn as well as for the repositioning of Nigeria within the global economy,” he said.